Is the dream you have for your life farther away than ever? This message should help you take heart. Although Joseph had a dream of ruling his brothers, he ended up in slavery. It seemed that his life was falling apart. But for Joseph, the dream never died. Do You Know the True Essence of the Gospel? The Apostle Paul wrote the book of Galatians with one primary purpose in mind: to defend the true Gospel of Christ from distortion. Walking us through the book of Galatians, Pastor Lutzer reminds us that any time we add to the Gospel, we are contaminating and corrupting its purity. But do we know the one true Gospel? 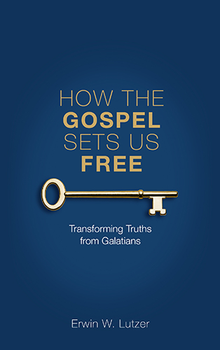 As we are led through Paul’s letter, Pastor Lutzer calls us to understand the authentic, unaltered Gospel, its implications for us, and how we can enjoy our freedom in Christ. Just published in 2019, this paperback contains 54 pages. To request today’s message on CD instead of this book, please click here.